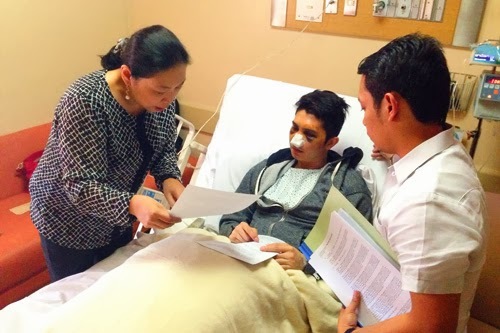 DZMM confirmed that Vhong Navarro’s camp has filed cases against Cedric Lee, DenieceCornejo and other 6 unnamed persons who were allegedly involved in the mauling. The complaint was formalized at around 5 pm with Atty. Alma Mallonga as Navarro’s legal counsel. The entire country is waiting forward to this moment especially the netizens who are fans of the said actor. There are so many violent reactions on the topic that are shown online and this is the moment that many are looking forward to. The evidences are not complete yet but the camp of Navarro is gathering them little by little to be used for the case. The fact is he even said that there is already a CCTV footage gathered that will give light to the case. The said footage was taken last January 22 when the incident took place in Cornejo’s condominium. The National Bureau of Investigation (NBI) will investigate on this and hopefully, the case will be solved. The said cases are said to be non-bailable and Cedric Lee’s camp will have to do something about it in order to win the case. The sworn statement of Navarro, medico-legal report, Rommel dela Cruz’ statements, an unnamed TV host, affidavits of the condominium security guards, a copy of the blotter, the police officers who were there during the blotter, a copy of the CCTV footage will give light to what really happened that night. We look forward to what will happen next to the case filed by Navarro against Cedric Lee, Deniece Cornejo and others. For more news on the said incident, stay stuck to this website. Be updated on this case in our future post here.